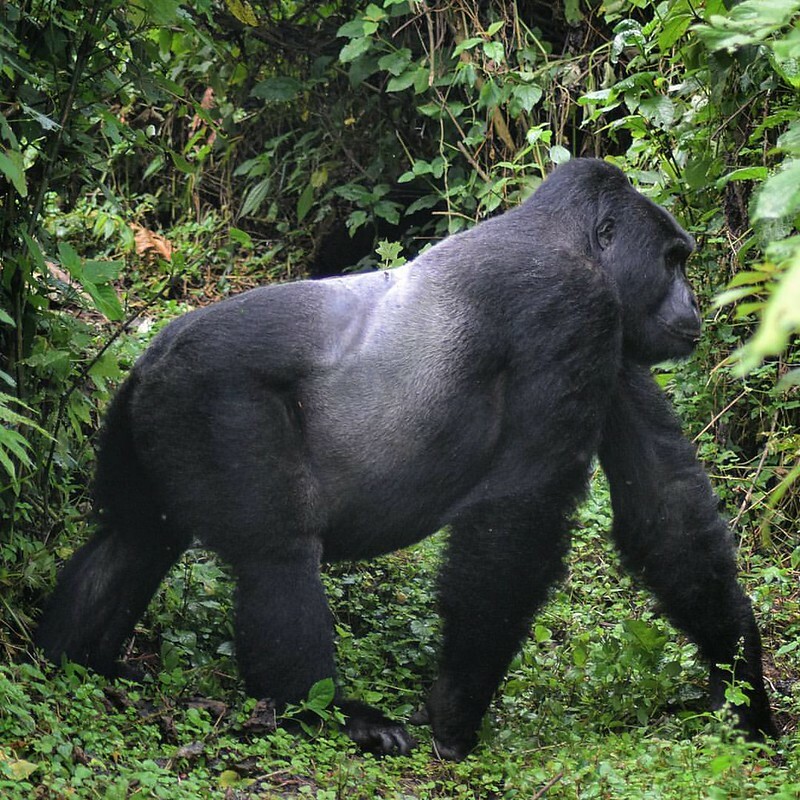 There are three main subspecies of gorillas in the world: eastern lowland, western lowland and mountain gorillas. 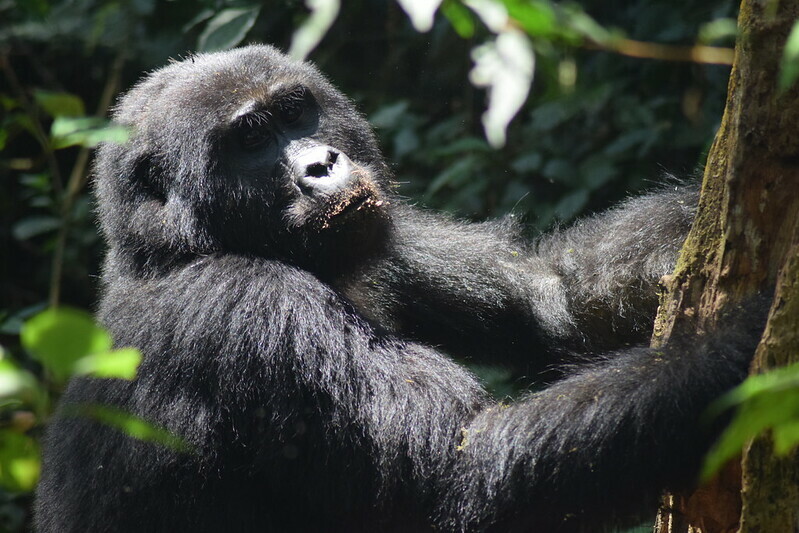 Although there are over 100,000 eastern and western lowland gorillas in current population, mountain gorillas are still a critically endangered species, with less than 900 gorillas remaining on Earth today. 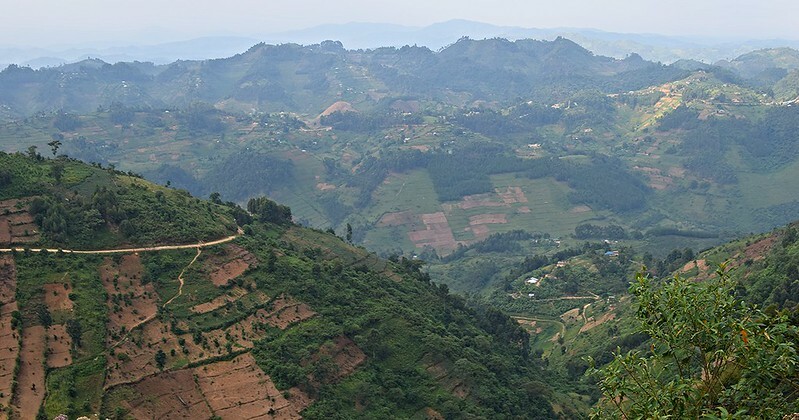 These wild mountain gorillas can be found high in the mountains of Rwanda, Uganda, and the Congo. 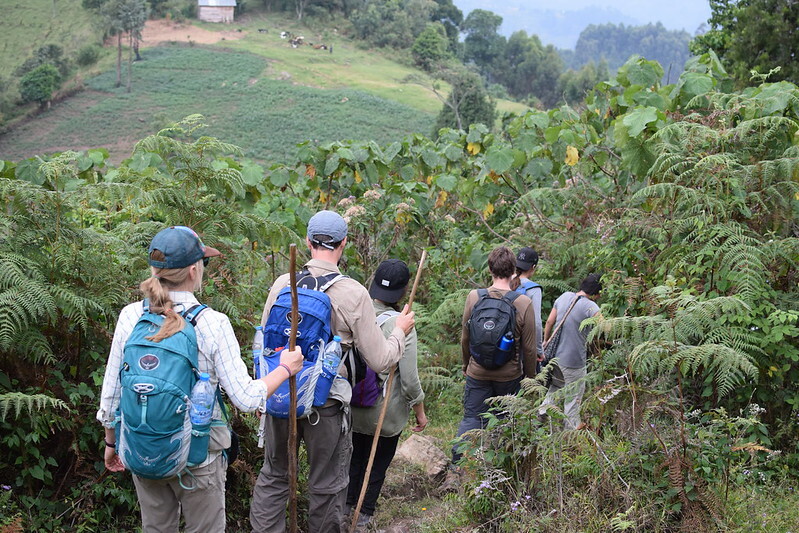 Our tour group of 20 was issued permits to trek in the Bwinidi Impenetrable Forest. 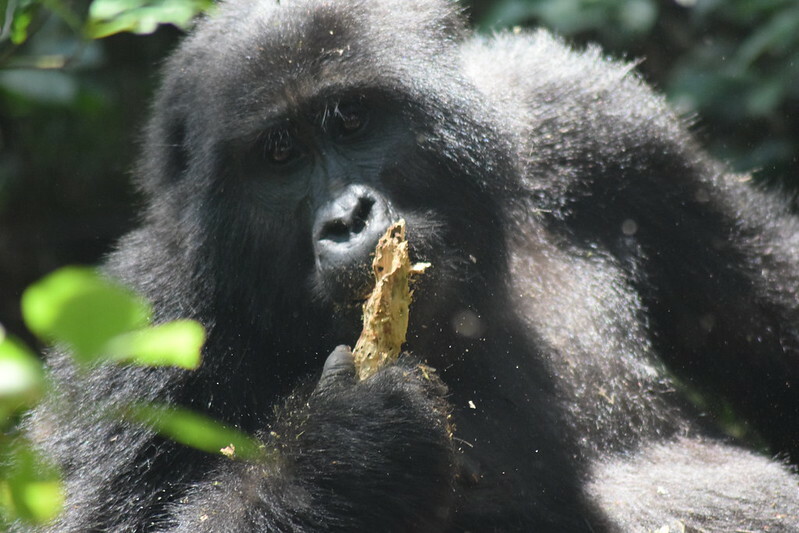 We were split into three tracking teams, where each tracking team would be assigned to one of the five different gorilla families living here. 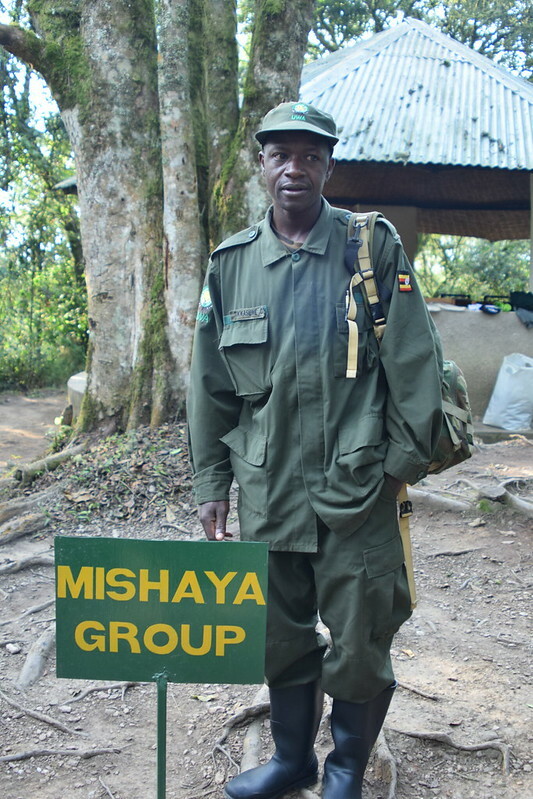 My group was assigned to trek for the Mishaya group. 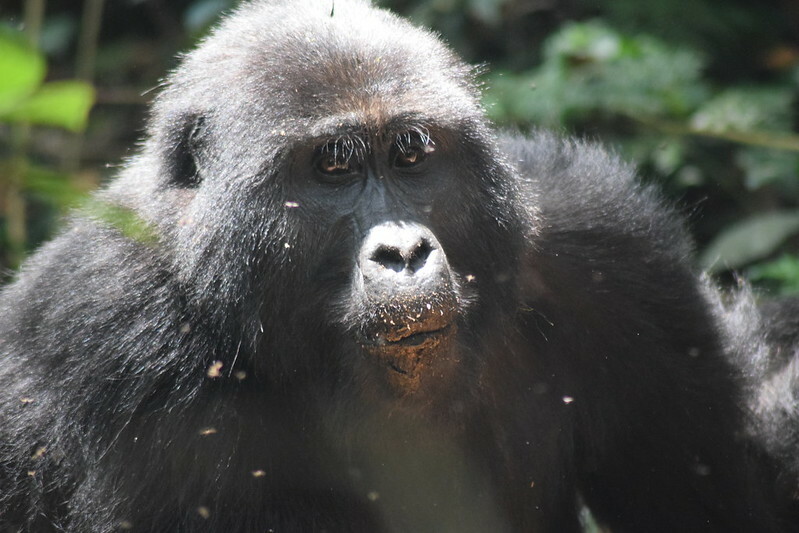 Mishaya means “long jaw” and the group is named after the dominant silverback male in the group. 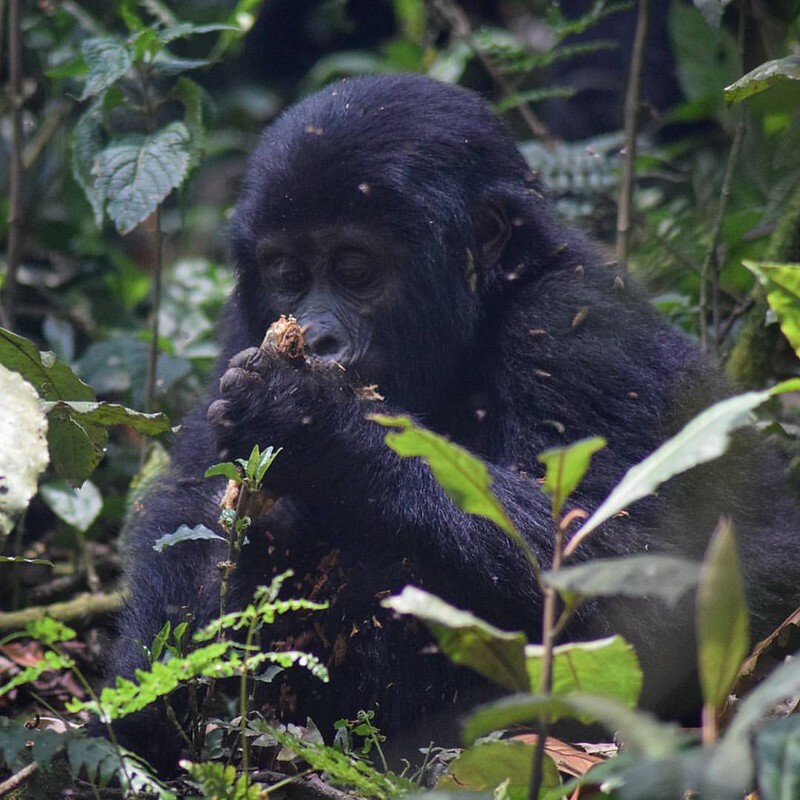 There are twenty mountain gorillas in the Mishaya group, including seven baby gorillas. 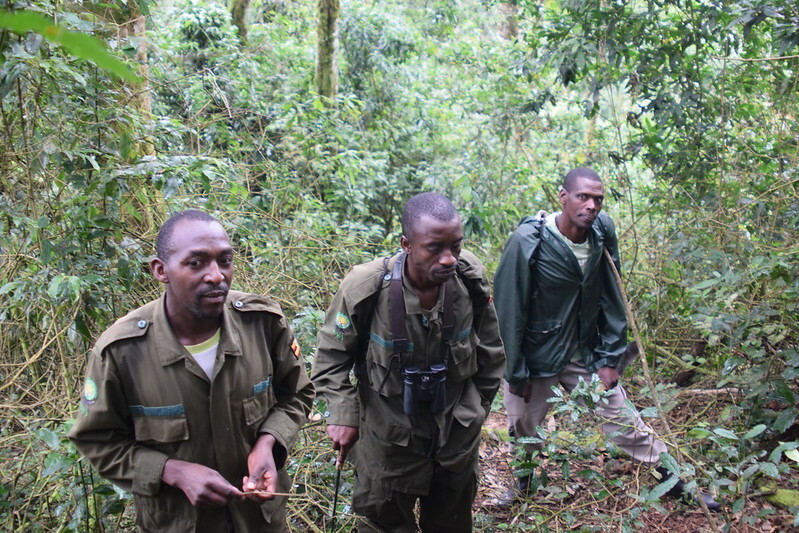 This group is followed daily by local trackers, who monitor their behavior and well-being. 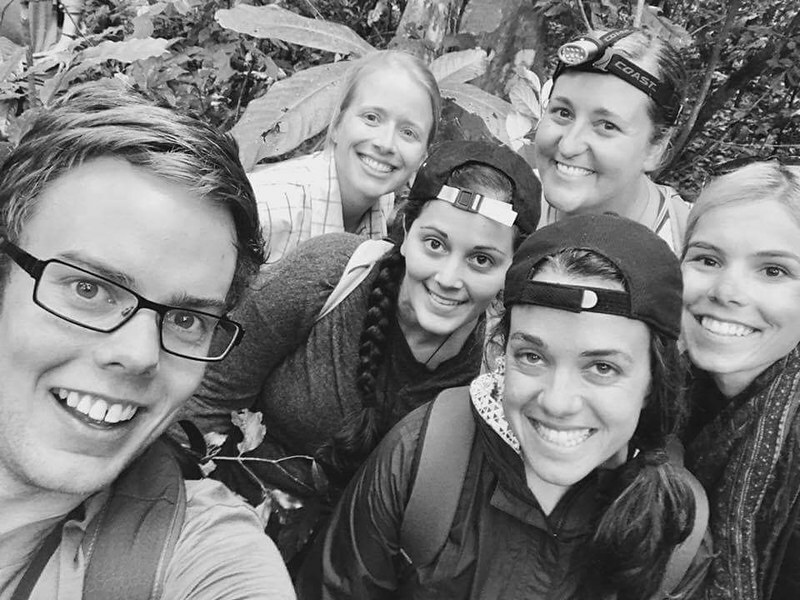 It took our group almost two hours to reach the family, accompanied by our local guide, Obed, as well as, two guards with automatic weapons, who were there to protect us from other predators of the jungle. They use the weapons to fire shots in the air, to scare away the animals. 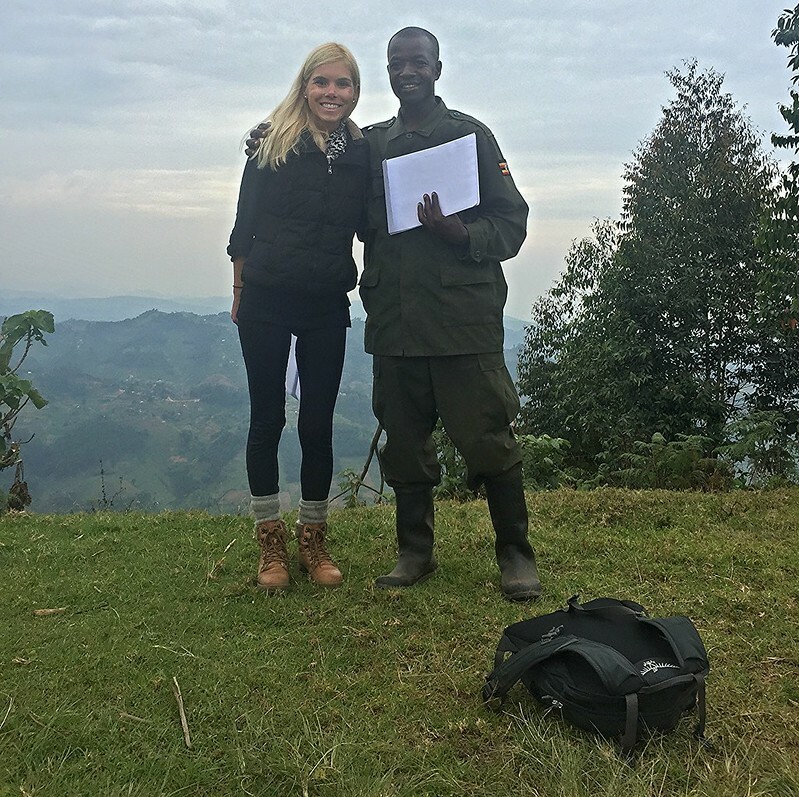 On the trek, although I was anxious just to reach the gorillas, I couldn’t help but stop and stare in wonder at the beautiful mountains surrounding us. 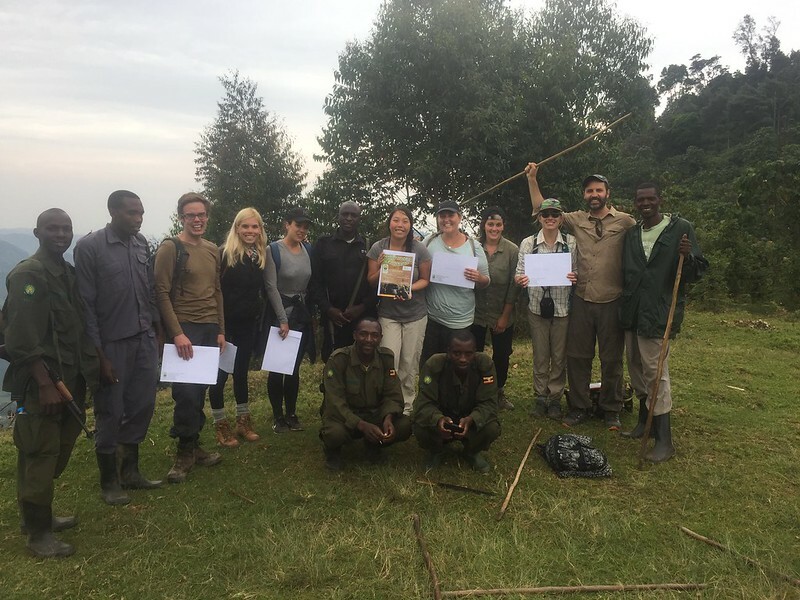 When we finally reached the family we were given rules to during the visit, including what to do if a gorilla approaches or touches you. We could spend a maximum of one hour with the gorillas, and needed to avoid human contact, in order to prevent disease transmission. They also advise not to make eye contact with them, which is seen as a sign of aggression. Lastly, even if you’re afraid, never run away. 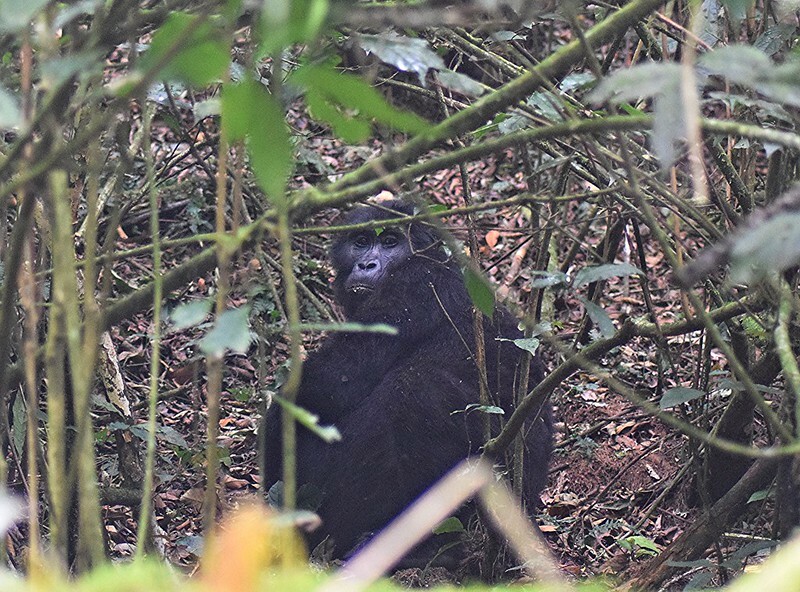 😮 Prior to visiting the gorillas, I had assumed that the family would be sitting in the forest; however, in the beginning, that was definitely not the case! 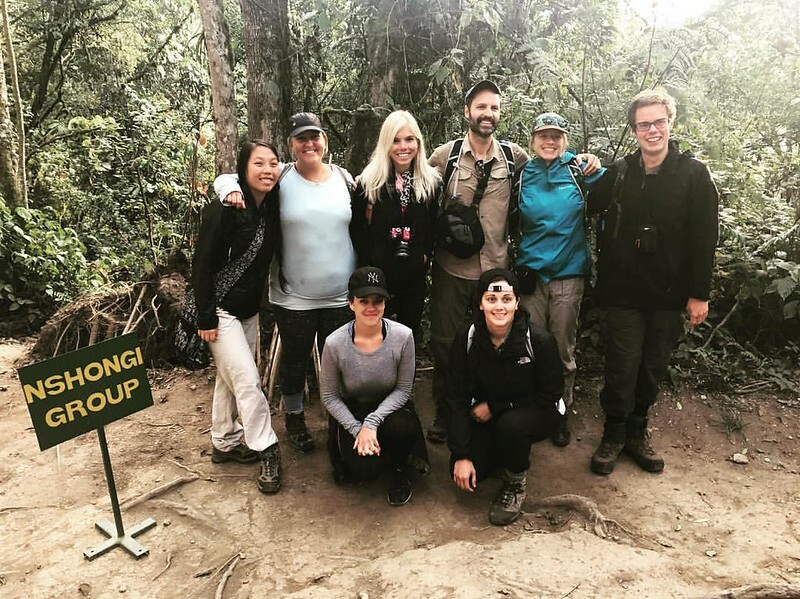 It was quite hectic and stressful as we raced through the jungle just to keep up with the group for the first twenty minutes. The terrain was hilly, slippery and covered in thick branches and muddy ditches. 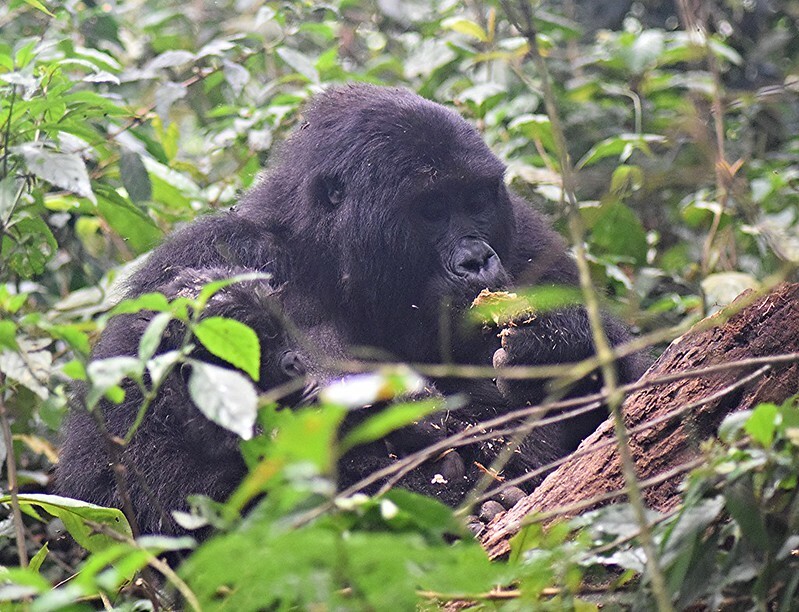 We would catch small glimpses of the silverback or a small baby before they would take off again into the jungle. They moved so quickly and got so close to us, it left everyone amazed, but on-edge at the same time. It was as if one false move could land us in contact with these powerful creatures. At one point our guide Obed even told me to stand still. Apparently the female gorilla was approaching me with a warning, since I was holding my GoPro up and apparently it looked threatening to the female mother. 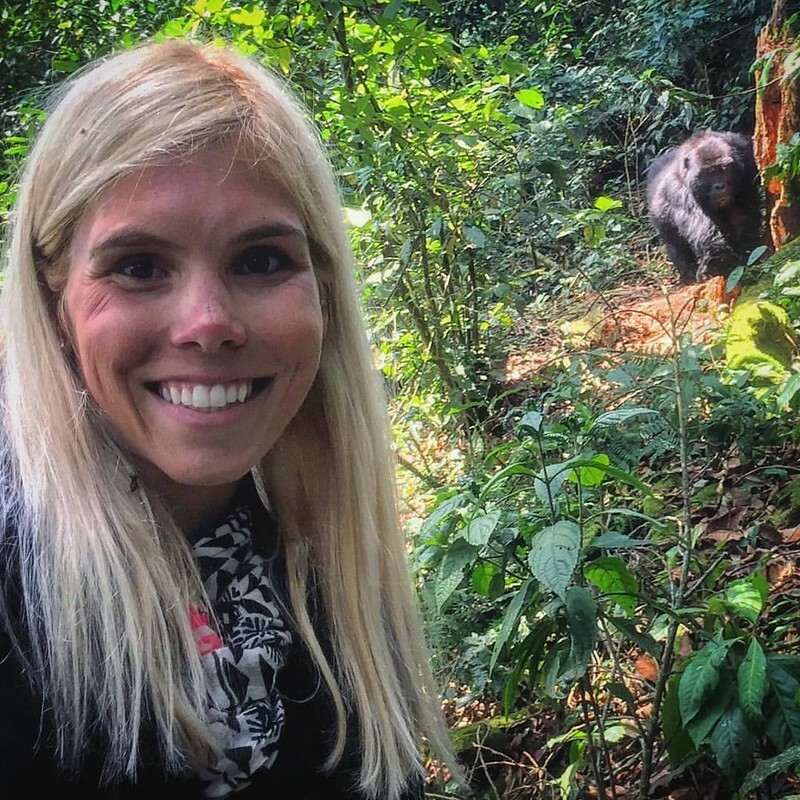 I slowly lowered my selfie stick and thankfully the gorillas walked away. 🙂 After twenty chaotic minutes, the group finally settled down and we were able to calmly watch them as they munched on bugs inside logs. 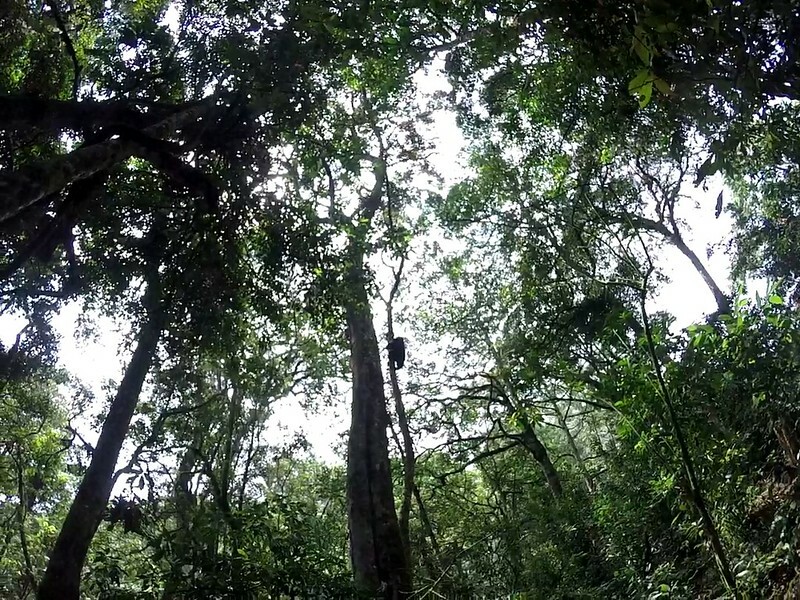 At one point, a baby gorilla came flying down the tree like a firefighter on a pole. 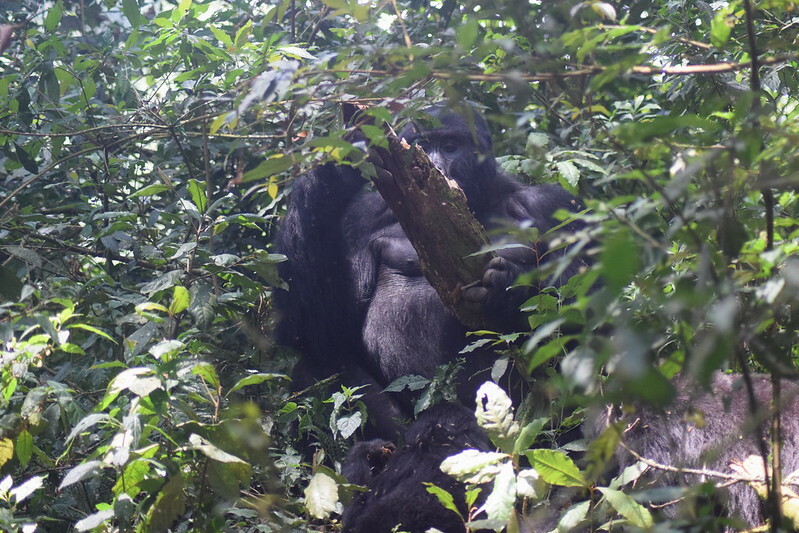 My hair was covered in brush, and one girl in our group got hit in the head with a piece of fruit that the gorilla had been holding. 😛 The hour spent with the gorillas was filled with moments of awe and adrenaline. We were constantly monitoring these powerful creatures, which at times seemed a little too close for comfort. In the end I found this to be one of the most exhilarating experiences I’ve had to date, and definitely each tracking groups experience will vary. 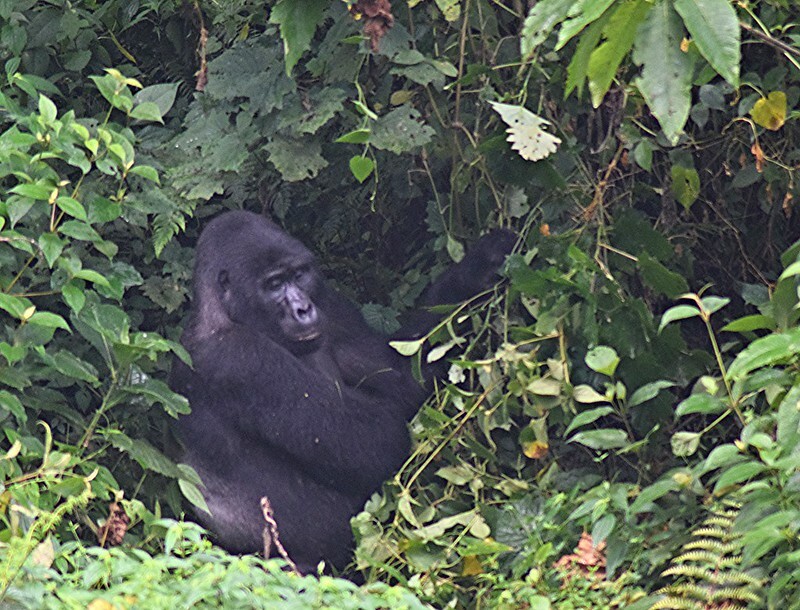 Although these gorillas are habituated to humans, at the end of the day, they are still wild animals, capable of unpredictable behavior. 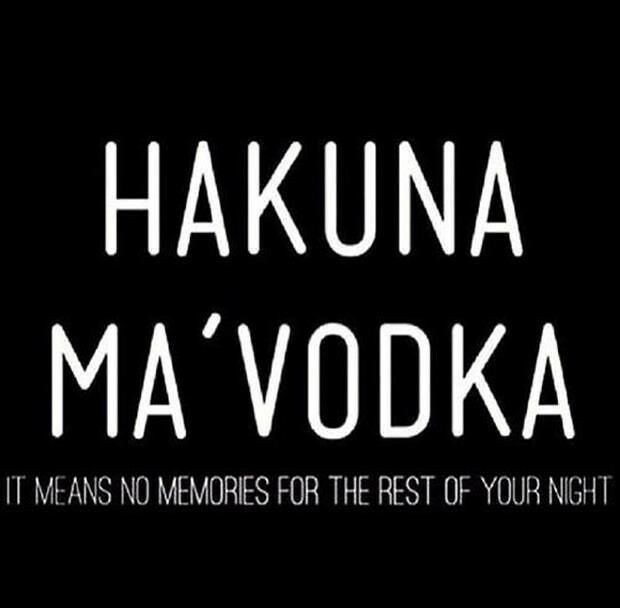 A good example of this would be with the Pushaya tracking group from our tour. 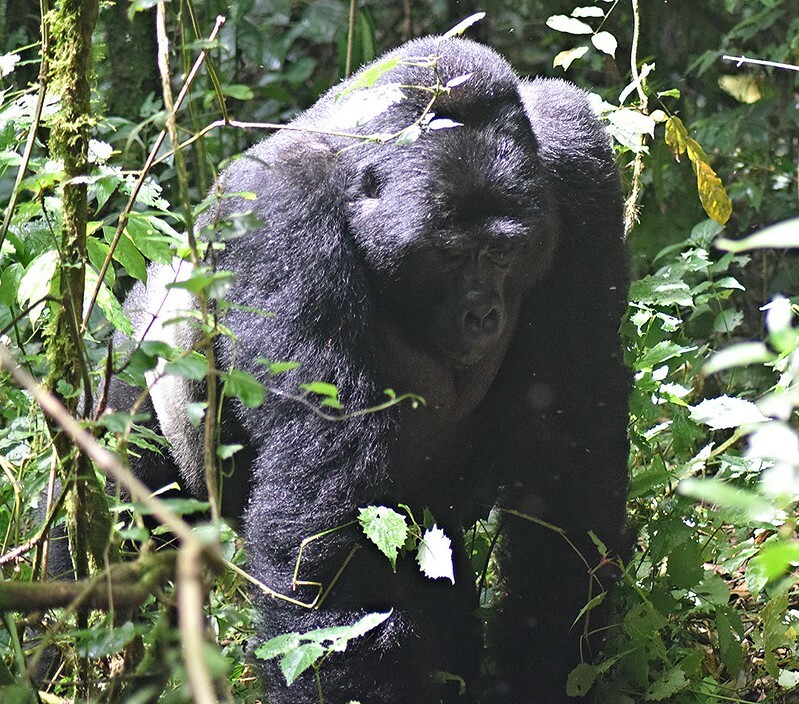 Ironically, Pushaya, named after the male silverback, means peaceful; however, he was anything but cordial, as he decided to charge at the group and show his fangs. For this reason, the tracking team had to leave in search of a different family. 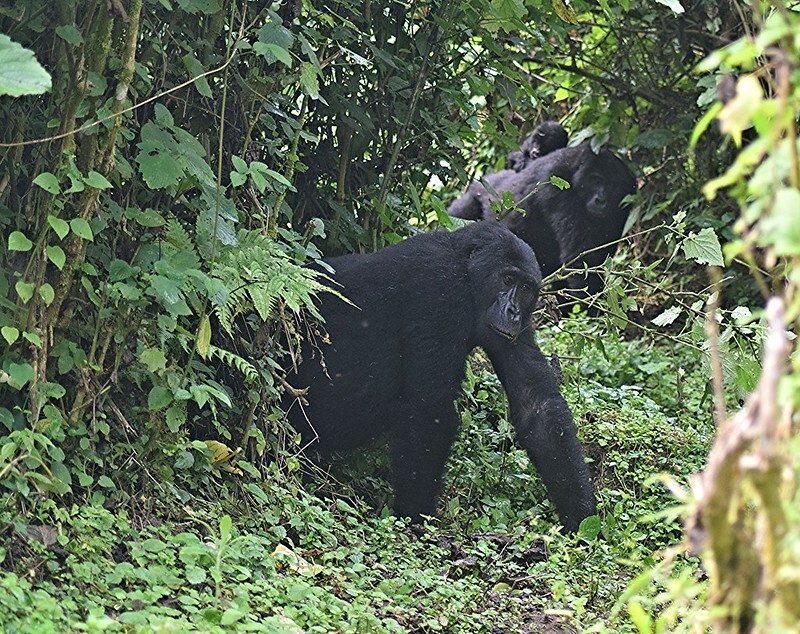 Their tracking experience was far from calm, as they spent nearly seven hours on the move searching for these gorillas. One girl fell into a muddy elephant footprint, one guy got attacked by a bunch of ants on his arm, and another girl ended up dislocating her shoulder from a bad fall. 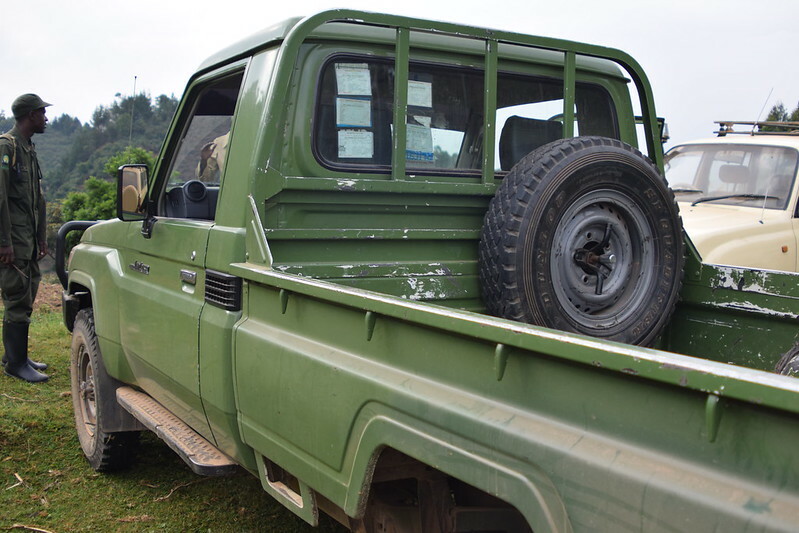 Since people pay so much for these permits, they will refund you 50% if you don’t find the gorillas, and they also offer additional services like a porter to carry your things for 15 USD, and even as extreme as being carried there on a stretcher, starting at 300 USD. Fabulous experience indeed!! 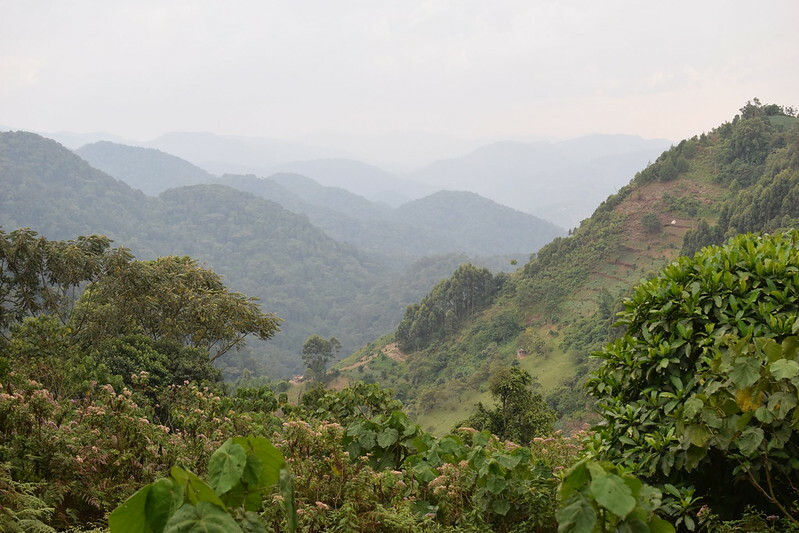 Wonder if there could be days when there are too many people vying to go for the expeditions to see the gorillas. Incredible post! 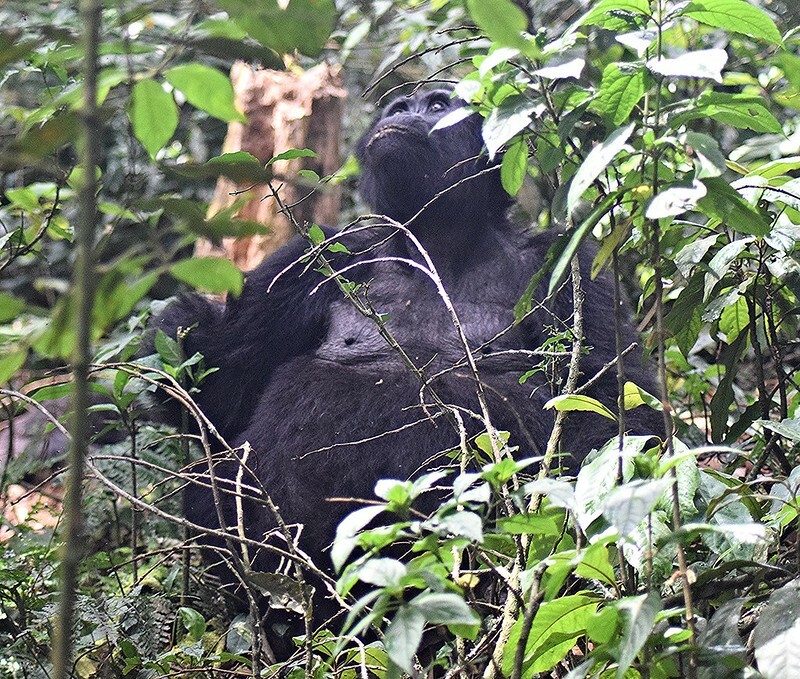 I really felt the rush as you were describing tracking the gorilla family. 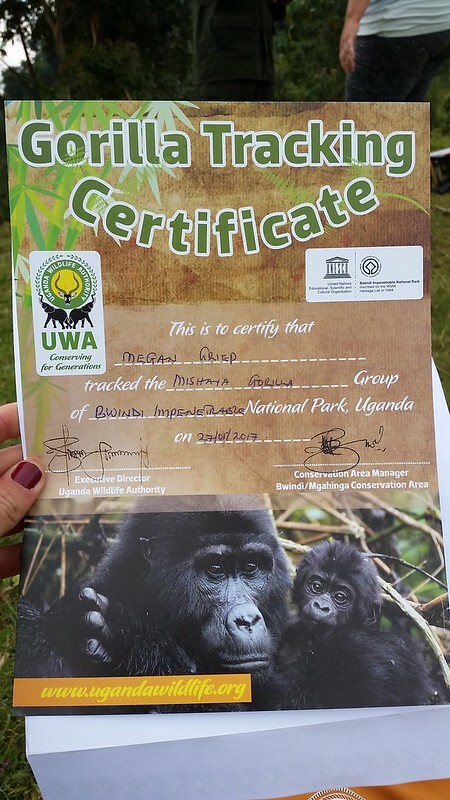 Seeing gorillas in the wild is on my bucket list and this post has definitely made me want to go even more! !